Where are the ANGRY BIRD fans? Listen up! There are some new games you need to know about that will have your kids entertained for hours! Are you and your kids ready to play ANGRY BIRDS in a whole new way? Check these out! Race head-to-head to topple the pirate pigs! Slingshot your kart through swinging obstacles and avoid the pigs to be the first to the finish line. Continue the racing action on your mobile device by using the included TELEPODS base to teleport your kart into the new ANGRY BIRDS™ GO! app. Set includes two k=arts featuring favorite ANGRY BIRDS™ characters, one of which is exclusive to this set. 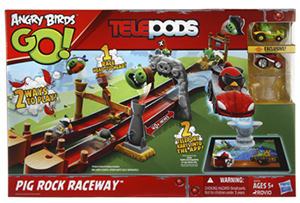 BUY Angry Birds Go Pig Rock Raceway Set . 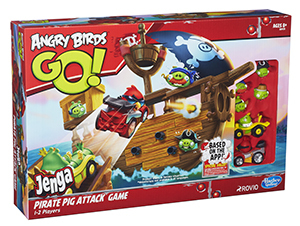 Set sail as you battle pirate pigs in the new ANGRY BIRDS GO! JENGA PIRATE PIG ATTACK GAME. Race head to head against your rival to destroy the pirate ship! Slingshot your kart down the slope to capture the victory flag and take down the pirate pigs. Players can also unlock ANGRY BIRDS GO! in-app content with a special code in each pack. BUY Angry Birds Go! Jenga Pirate Pig Attack Game . Since it is cold out we are spending a lot of time indoors, games are very exciting around here! My son is a BIG ANGRY BIRDS fan! When I saw the ANGRY BIRDS GO! JENGA I knew that he would be thrilled! I hoped that my daughter would enjoy it too. And she did! It was fun and easy to set up. You set up the ship using the blocks. Line up your cars and prepare them for attack! Watch as the ship is attacked and pieces fall. The first person to hit gets the pieces. Continue until all the ship has fallen down and count your pieces. See who won and do it again! A-Maze-Ing Toy Giveaway for Cartoon Network fans. Hasbro and Cartoon Network have come together to celebrate the season of giving with an A-Maze-Ing Toy Giveaway for Cartoon Network fans. Beginning today, fans between the ages of 6-17 can enter the online sweepstakes at CartoonNetwork.com/win for their chance to be one of 251 winners. The sweepstakes, which is free to enter, will run through December 8 and is open to residents of the 50 United States and D.C. Two hundred and fifty prize packs – each containing a NERF REBELLE HEARTBREAKER BOW, an ANGRY BIRDS GO! PIRATE PIG ATTACK GAME and a KRE-O CITYVILLE SKYSCRAPER MAYHEM set – will be given away to fans, and Cartoon Network will also choose one lucky grand prize winner at random to receive a massive delivery of 250 Hasbro toys and games this holiday season. Now one LOL&C reader can WIN a Jenga Pirate Pig Attack Game! Your kids, nieces, nephews or friends will LOVE this! Enter via the form below. Also, don’t forget to download ANGRY BIRDS GO! from Rovio Entertainment coming to mobile platforms on December 11th.